The French and the Italians documented their cuisines. Our grandmas simply didn't care. They presumed that their daughters and daughters-in-law will carry on their heritage. Well, they were wrong as times have changed. In the process, so many of recipes are dying, day in and day out. Everyday some awesome recipe is dying. When non-vegetarians wonder how people veggie foods every day, treat them to the wonderful world of vegetarian food and they will be surprised. Give them pasta sans chicken and biriyani sans meat, they are going to look at veg food as less-than-optimal. Gladly, there are some who are on a mission to recover and document those recipes before they die forever. 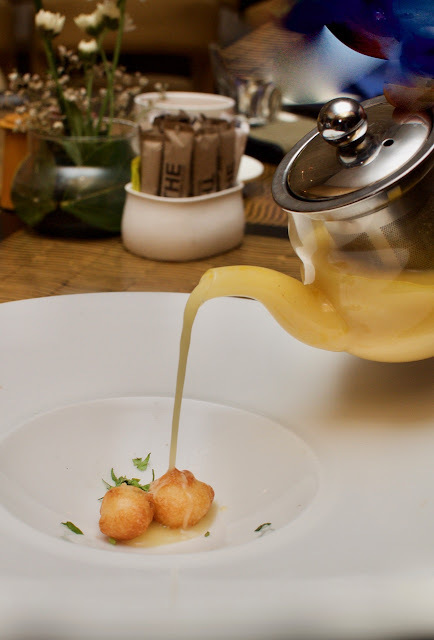 The Park, with Rakesh Ragunathan is showcasing a bunch of those recipes in this festival called Annam to Arancini. They've taken recipes from grandma's kitchens which are laborious and added a modern presentation twist to it. Only the presentation is twisted, the recipes are apparently as straight as they can be. From the choice of four rasams, I got the Vepam Poo rasam and the More Rasam. Tangy, authentic rasams brought back memories of the era gone by when our neighbours, who were Tam-Brams used to send us food once in a while. 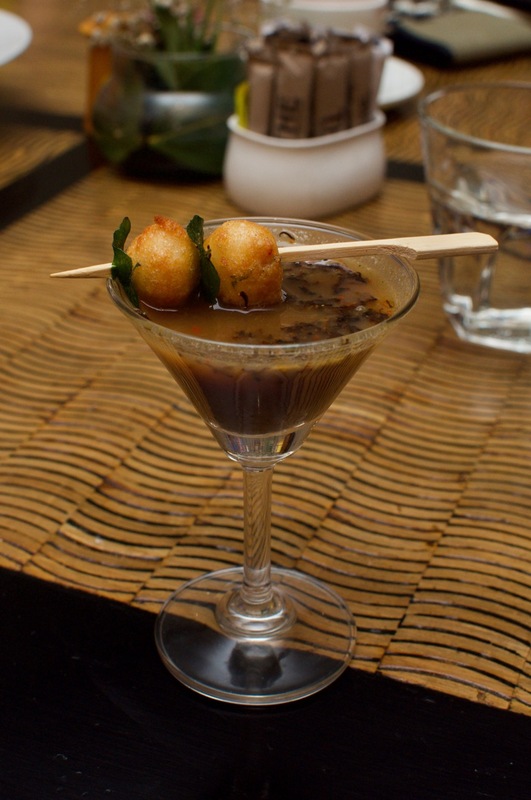 The Vepam Poo (Neem flower) rasam was nice and tangy with the fried flowers floating all over adding a new flavour element. There were Mysore Bondas in both rasams; while in the Vepam poo rasam it was placed on top of the glass, in the More Rasam (buttermilk rasam), it was dunked in a soup plate with the broth being poured over. 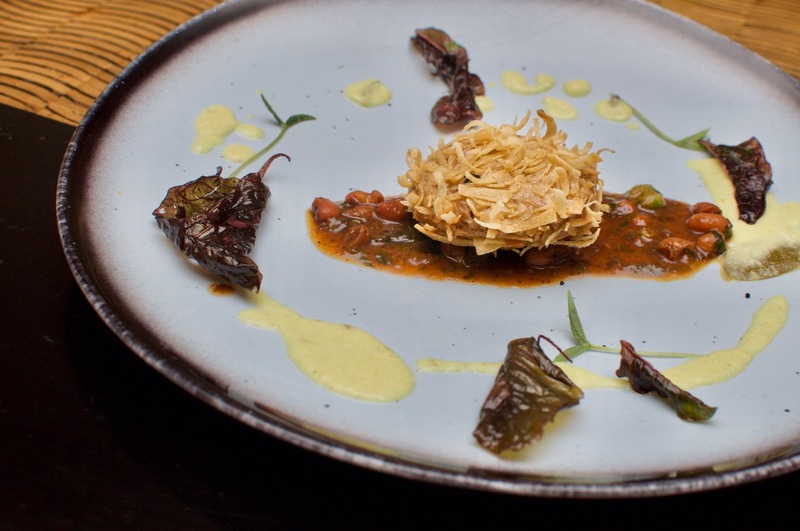 The More Rasam was fighting a close battle for attention and it was hard to pick a winner. South Indian salads? Well, South Indian, for that matter, Indian cuisines were not course based but plate based. We've always had all the courses placed in front of us in a single plate, so while we've always had the poriyals, we don't seem to relate to them as salads. Here, there was a platter of four salads. Various versions of poriyals were presented as salads. I'm going to run to the main course because that was......well, read on. We had two main courses to eat that day and the first one was a Iyer Puliyodhari with Karamani Kozhambu. That loosely translates to Brahmin variety rice with gravy. This was a truly re-imagined dish. There was the puliyodharai that was coated with fried appalams on a bed of the gravy and bits and pieces of the fried bay leaf and buttermilk. 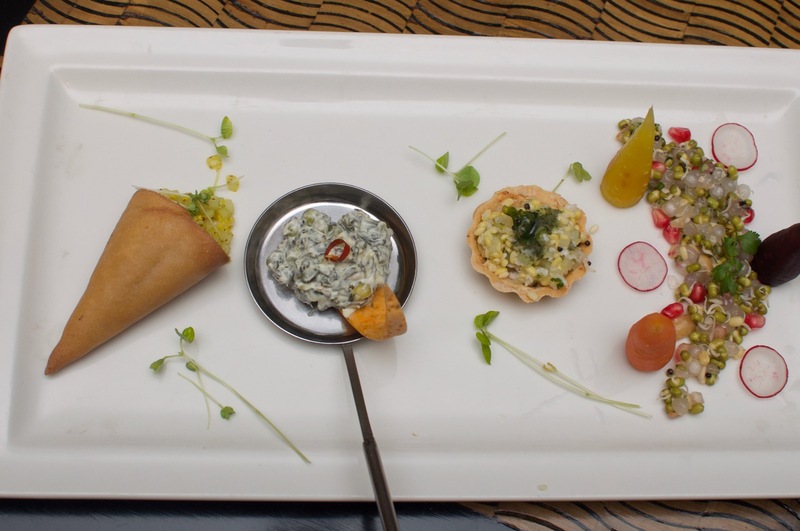 The flavours were beautifully captured, completely un-adulterated or diluted and presented in a re-imagined way. I was craving for more. And I got more. The Kootan Choru, is a simple sambar rice with potatoes, but there was nothing simple about this dish here. It was sambar rice stuffed in a potato roulade. Every flavour of this classic dish from Tirunelveli was there, so much so that even the drumsticks weren't peeled off, but whole. You had to use your hands for that, but clearly, the flavour was more important in this than the small inconvenience for taking the drum stick out. With vegetarian food like this, why would I ever miss meat? You get a platter of four desserts. A beautiful poori payasam but I love that with the crisp poori, so I didn't wait for it to soak. 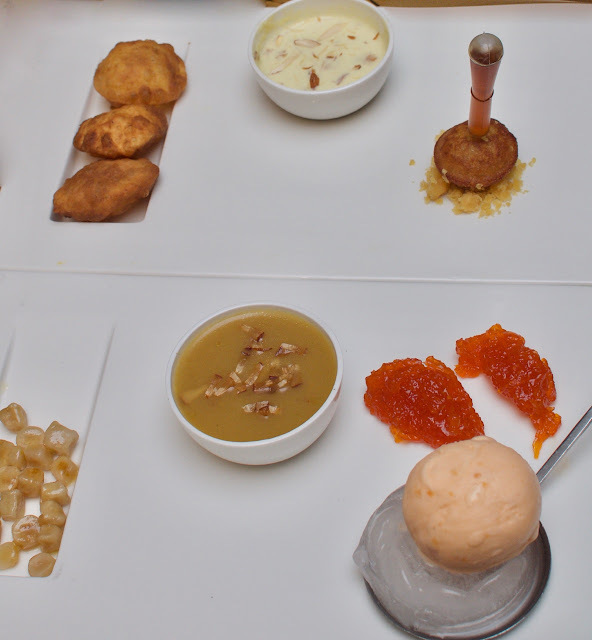 A kasi halwa (ash gourd mousse) with a corresponding gelato, an unni appam and the chakra pradhaman completed the meal. I loved the fact that while presentation was clearly re-imagined, flavours were not diluted at all, ingredients weren't replaced or spiced toned down for any audience. This festival is on till the 29th of April and I intend to go back to taste the other two main courses in the menu. 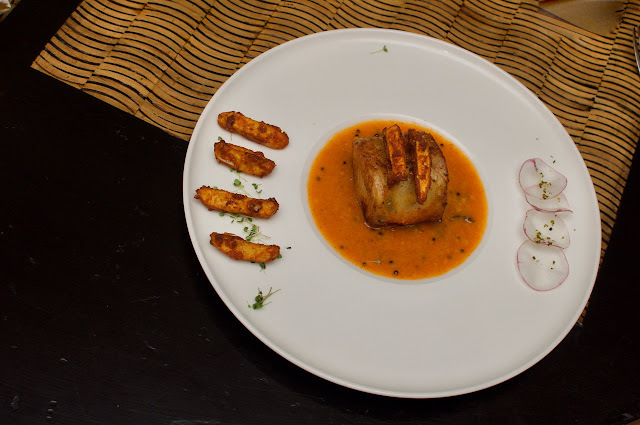 For 999 plus taxes, you get one choice of rasam, a four starter platter, one main course and a four platter dessert. This is going to the vegetarian meal to beat, this year!